It's aways gratifying to see a woman on the podium and last night's celebration of the Bernstein centennial put the renowned Marin Alsop up there to conduct an interesting program, which will be followed by a symposium today in Paul Hall at Juilliard from 3:00 to 6:00 PM. Maestro Alsop (a Juilliard alumna) is not only a fine conductor, judging by the sound of the always excellent Juilliard Orchestra, but a guiding light to the singers, as expressed by the singers themselves. Her presence on the podium was the right choice since she was one of Bernstein's best known pupils. The part of the program we wish to focus on is Bernstein's Songfest, a compilation of a dozen songs, each from a different poet. Our enjoyment of the songs lay more in the performances than in the songs themselves. Our appreciation for "modern" poetry and the kind of music it inspires is somewhat deficient but our appreciation for a good delivery is unmatched. It seems to us that the training at Juilliard helps a singer to make sense of even the nonsensical. For this, we credit Steven Blier who has coached these singers (all students or alumni of Juilliard) for his New York Festival of Song. Last year at NYFOS we hear this Bernstein cycle reduced for piano by John Musto. Unlike his tuneful and rhythmic music for Candide and West Side Story, many of the texts Bernstein set appear uninteresting on the page and don't seem to want to be set to music. There were a few exceptions. The 17th c. American poet Ann Bradstreet wrote an encomium to her spouse "To My Dear and Loving Husband", the rhyme scheme and rhythm of which inspired Bernstein to write our favorite selection of the dozen. 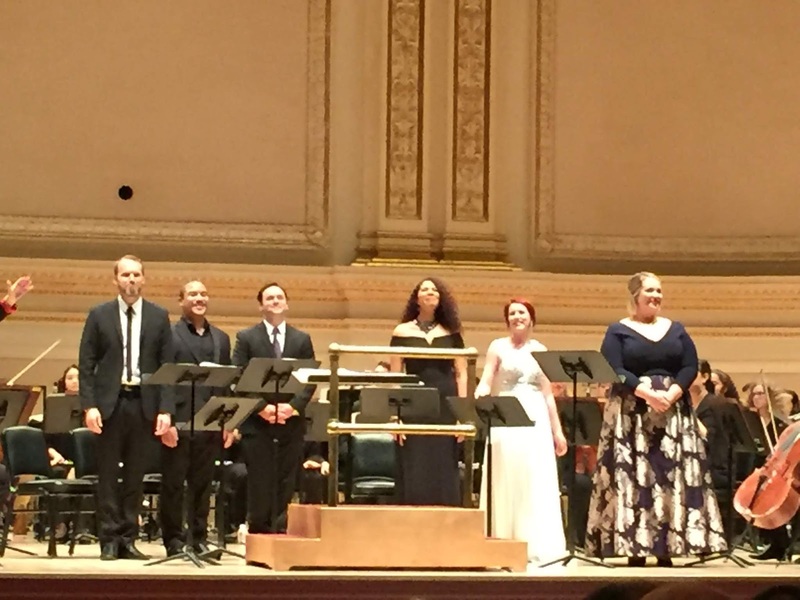 Sung by soprano Meghan Kasanders and mezzo-sopranos Naomi Louisa O'Connell and Amanda Lynn Bottoms, the many layers of love and adoration filled our heart with joy, and maybe even a touch of envy for such all-encompassing adoration. This is a song we want to hear again and again. Another song we enjoyed was the Edna St. Vincent Millay sonnet "What Lips My Lips Have Kissed". Although Ms. Millay belongs clearly to the 20th c. the sonnet rhymes and scans and was a worthy candidate for setting. To hear it performed by Ms. Bottoms was an emotional experience, reminding one of the pain of loss. The metaphor of a lonely winter tree from which all the birds have flown was powerful. Gertrude Stein's "Storyette H. M." although written in Stein's customary repetitive manner, made sense through the dramatic performance by Ms. Kasanders as the one who was left and bass Ryann McKinny as the one who was leaving. What an effective couple they made! Ms. Kasanders had a strong solo in "A Julia de Burgos" which was sung in Spanish and invested with Latin rhythms as well. The versatile tenor Paul Appleby has a way of interpreting contemporary American songs that sets him apart. We have no idea what Gregory Corso's "Zizi's Lament" meant by "laughing sickness", but no matter; the delivery was filled with humor and Bernstein employed a sinuously exotic melody to suggest the Middle East. Bernstein's orchestration provided plenty of "laughing figures". Mr. McKinny performed Walt Whitman's "To What You Said" against a background of plaintive strings. Ms. O'Connell performed Conrad Aiken's lament "Music I Heard with You" accompanied by a gorgeous harp solo. Their splendid voices fell beautifully on the ear. We couldn't call the duet of baritone Aubrey Allicock and Ms. Bottoms "color blind" but that's a good thing in our opinion. Mr. Allicock performed Langston Hughes "I, Too, Sing America" interweaved with Ms. Bottoms performance of June Jordan's "Okay 'Negroes'" was affecting. What was going through our head was the progress toward true equality that the poets could not imagine. Of course there is more work to be done in this area but progress is encouraging. Mr. Allicock's solo "The Pennycandystore Beyond the El" tried to make something musical of the Lawrence Ferlinghetti text and succeeded beyond our expectations. The ensemble of six sounded especially fine together, even in the odd Frank O'Hara text "To the Poem". Even odder was "if you can't eat you got to" with some wonderful sounds emanating from the tuba. Closing the set was Edgar Allan Poe's lengthy paean to the spirit "Israfel" who produces heavenly music, much like Orpheus. We think of these six singers as incarnations of Orpheus!